Map of Alberta - Do YOU Need a Quick Reference? Below is a large map of Alberta showing main cities and highways. Use it to quickly find your way around the province. First of all, where is Alberta? It lies on the left side of your Canada map. One province removed from the west coast. The only province to the west is British Columbia. Alberta covers a large area; the distance from the north to south extreme is 11° latitude, which works out to about 1200 km (750 miles). At its widest point through, through Edmonton, it is just over 65g0 km. This contributes to a total area of over 660 thousand square km (255,500 sq miles). The population is a little over 4 million. It touches the US - Canadian border on the south, bordering along the northern edge of Montana, and to our north is the great Northwest Territories (NWT). Saskatchewan lies on the east. Here is the map, focussing on Alberta. The red lines on the map show you many of the primary highways, the lowest numbered ones from 1 to 17 and the major two-digit numbered roads. The Trans-Canada Highway, which runs from the Maritimes westward through Alberta (Medicine Hat and Calgary) and onwards to the British Columbia coast. The Canamex Highway, the international corridor which runs from Mexico northward through the western US and Alberta into Lethbridge, and through Grande Prairie into BC. In Alberta, we call our central stretch the Queen Elizabeth II, or QE2 for short. It's the portion that connects Calgary and Edmonton. The Yellowhead Highway, Hwy 16, which runs from Manitoba through Edmonton and westwards to BC. 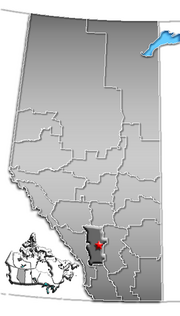 The larger city near the south end of Alberta is Calgary. It's the largest urban centre in the entire Province, and all the prairies. Find detailed street maps of the city here, and you can also check this unique downtown Calgary walking map. ...or Go back from this Map of Alberta webpage to the Alberta Canada Weather page now.